Thai Garden Design have recently completed this contemporary landscape for a couples newly constructed home, in the mountains of Hua Hin. The brief was to design and create a modern low maintenance garden, that mixed in a large number or organic planters and growing beds, for all-year-round produce that would feed the family. All around this large landscape you will find growing beds, organic fruit trees, a mix of herbs and vegetables, within a modern tropical setting. Some of this gardens produce includes: artichokes, stevia, kale, spinach, avocado, lemons and limes, lettuces, beets and carrots (to name just a few). Along with the self sufficiency element, the garden is littered with a mix of contemporary pathway pavers, mixed pebble stones, curving brick pathways and modern palm trees. It truly is a unique garden setting. Bamboo fences were constructed by the Thai Garden team, helping to differentiate between the different living and stroage areas. All parts of the home are easily accessible; and the outer perimeter has a tall live bamboo fence, providing privacy for all the occupants. The entire landscape is serviced by a lighting system, and a full watering system, that operates twice a day, to ensure the ongoing health of the wonderful mix of tropical trees and shrubs. The Thai Garden Design team were also responsible for the installing of a large lawn, view able from the main home and providing a wonderful setting for family play and socializing. 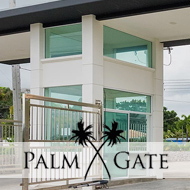 If you’re planning a new home in Thailand, that needs a unique and professional touch when it comes to the landscaping, then why not get in touch?